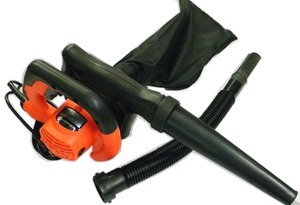 With an Exchangeable intake and exhaust, it's a blower and vacuum all in one unit. Powered by a 600 watt motor, the PB-20 is a versatile and powerful heavy duty blower. Weighing in at 6 lbs the PB-20 is also light weight and easy to handle. Removes lint and threads from textile and sewing machines and electronic motors. Cleans dust and chips from woodworking machines. Quickly sweeps floors and paved areas. Revitalizes furs and spots dries fabrics. Moves 3.8 cubic meters of air per minute. How to use the blower: By pulling the trigger and pushing the stopper, the switch will remain in the ON position even when the trigger is released, promoting efficient, continuous operation. By pulling the trigger again, the stopper is disengaged and the switch is turned OFF when the trigger is released. . An excessively large volume of in the dust bag will reduce the dust collecting efficiency of the blower. Frequently empty the dust bag to ensure maximum dust collecting efficiency.